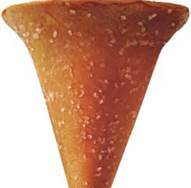 A sweet indulgence! Goat cheese and pink peppercorns are the perfect match for our MDF wheelhouse. They fit the criteria of being out of the box, something we would want to make over and over again and something we would want to serve and share with everyone. 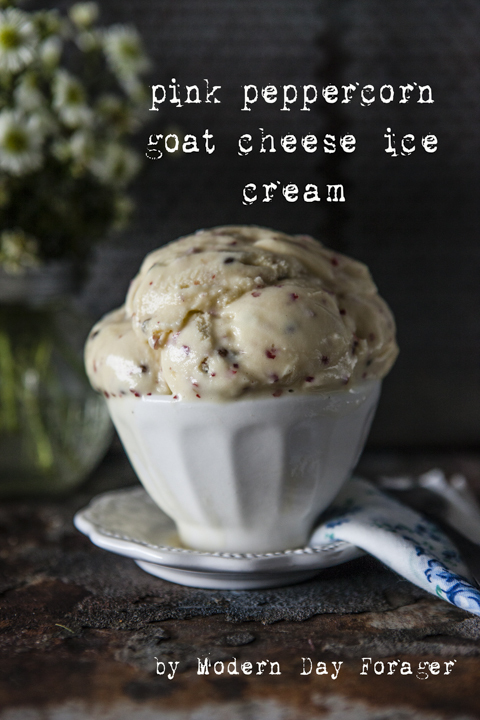 When thinking about this recipe we had a lot to consider, first, we needed a goat cheese that would not be overly strong, but something light and delicate, a mild cheese that still could hold its own, yet, still had some zip and tang. For us, it had to taste like a rich and creamy cheesecake. Next, we added pink peppercorns, which by the way, are not really peppercorns at all, they are dried pink berries from a rose shrub. Who knew? 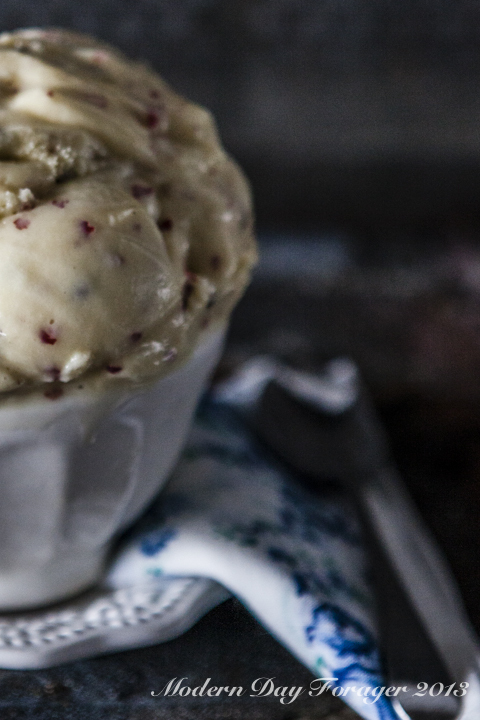 These lil pink pods are packed with spicy floral notes that add real depth to the ice cream, and a little bit of attitude and at the same time add some bite and chew. 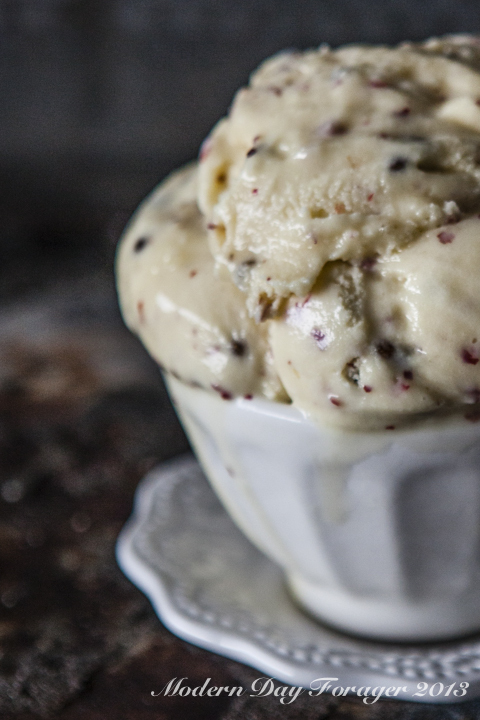 To push it over the edge and make it MDF worthy, we went all out and added lil chunks of rich honey comb to really make this icy goodness stand out, and with that, we just knew, we had to add the addition of drizzled honey into the ice cream mix, for a sweet mouth feel and a sweet finish, and boy oh boy, this sweet freeze will surly keep you coming back for more. Place goat cheese, honey and peppercorns in a large bowl and set aside. In a medium saucepan, warm the milk and sugar. In a medium bowl, whisk together the egg yolks. Slowly pour some of the warm milk mixture into the egg yolks, constantly whisking, to temper the eggs. Return the mixture to medium heat and continue whisking until the mixture thickens and coats your spatula well, pour it through a sieve onto the goat cheese, honey and peppercorns, stir until the cheese is melted and smooth. Stir until cool over an ice bath or chill the mixture thoroughly in the refrigerator. Freeze it according to your ice cream maker’s manufacturer’s directions. 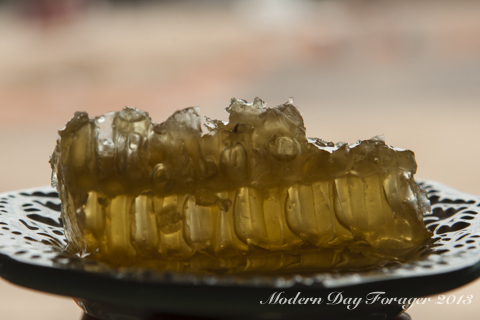 Transfer to a freezer safe storage bowl, stir in honey comb pieces, and drizzle honey and combine, then cover and freeze for at least 2 hours. 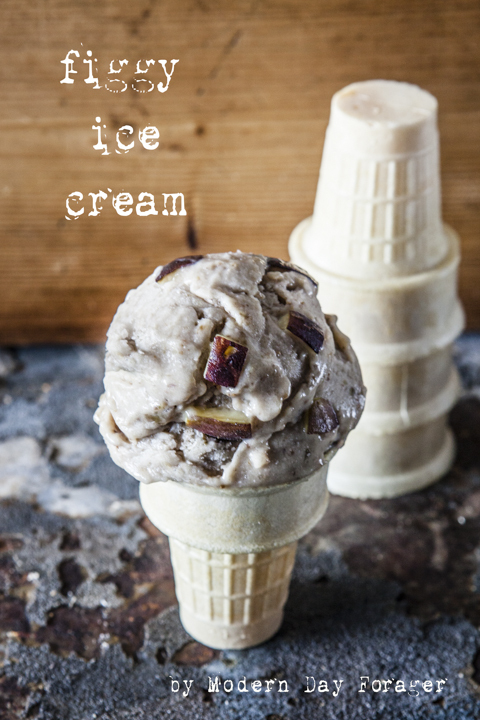 One of the reasons we took on ice cream this week is that we have been noticing a trend in the ice cream world, that ice cream never seems to taste enough like what it claims to be, or fully embraces the characteristics of the ingredients being used. We wanted to see if we could change that and focus on showcasing and highlighting the ingredients from beginning to end. 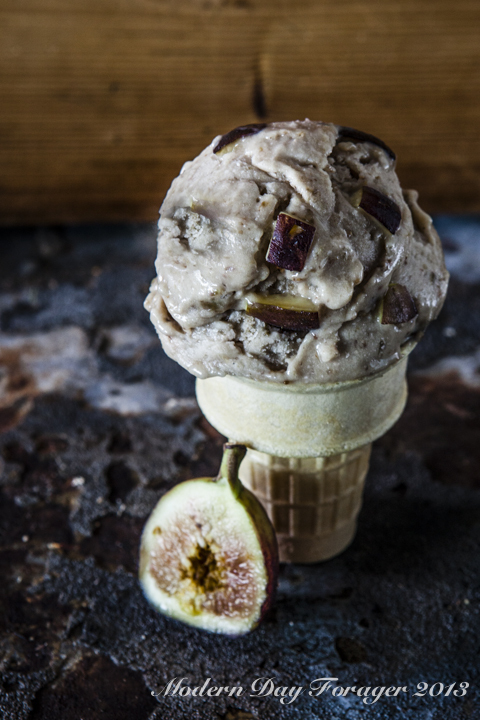 So here is the scoop with our recipe, we have packed it full of fig flavor from fresh figs and figgy pudding bitters in the ice cream base and then finishing it off by garnishing the freshly churned ice cream with even more fresh figs, taking advantage of their wonderful texture, that combines the chewiness of their flesh, the smoothness of their skin, and the crunchiness of their seeds. We think this says summer loud and clear. 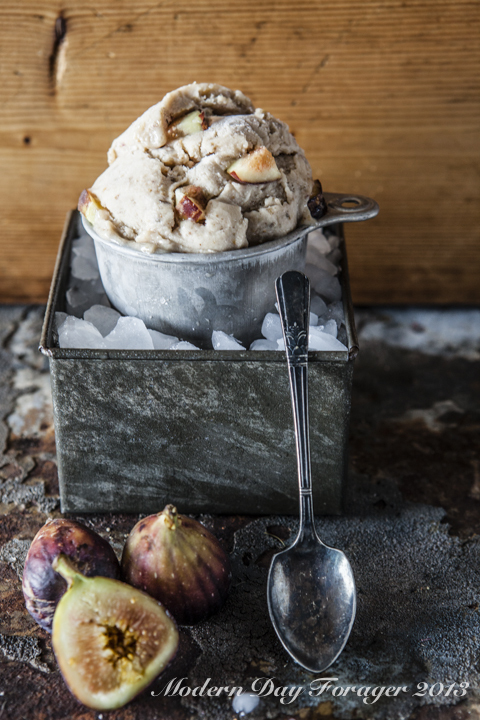 Place 20 diced figs in a medium saucepan with milk, cover and cook over medium heat, until tender, about 8 minutes. Add the sugar, and continue to cook, stirring frequently, until the figs are jam like, another 10 minutes. Purée the mixture with bitters in a food processor until smooth. Stir until cool over an ice bath or chill thoroughly in the refrigerator. Freeze it in your ice cream maker according to the manufacturer’s instructions. Sprinkle with diced figs and serve. 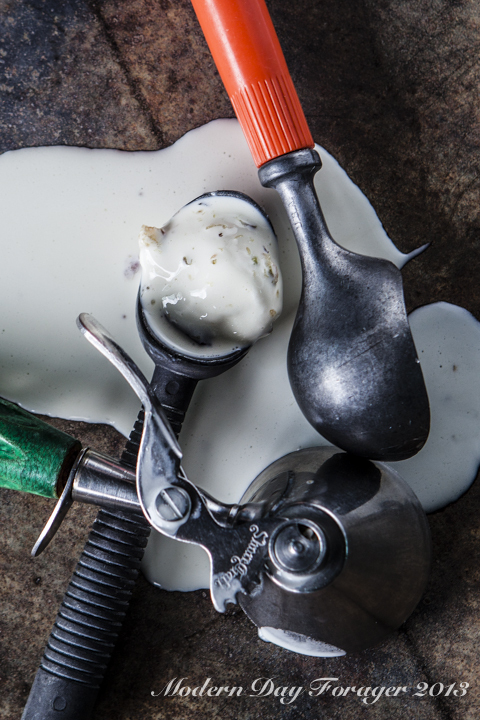 No matter what your age, we think there is something really satisfying, watching creamy rich vanilla ice cream being scooped into a tall chilled glass and then the anticipation of ice cold root beer being poured over the scoops, to create a old fashioned soda fountain float. 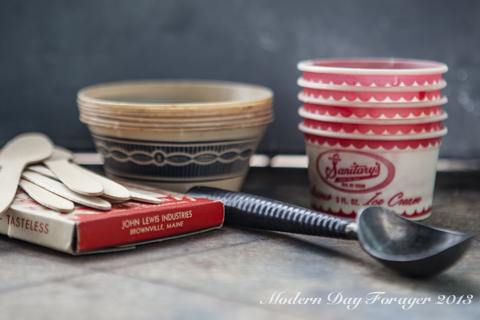 It’s what comes next, that is one of the best parts of this old school treat, there is the foam, the spill over and if that wasn’t enough, the top off of root beer, plus the nifty straw you get to stir, swirl, slurp and sip your icy glass of goodness. Does it get any better? We think not! 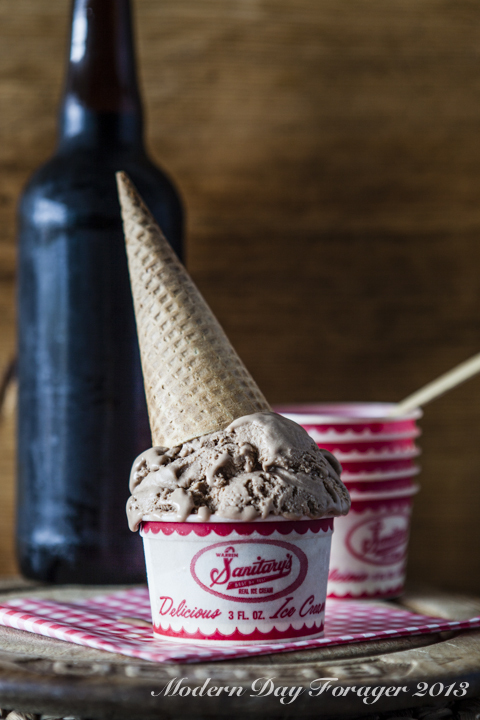 We replaced the traditional vanilla flavor of the ice cream and churned out our own milk chocolate stout ice cream. 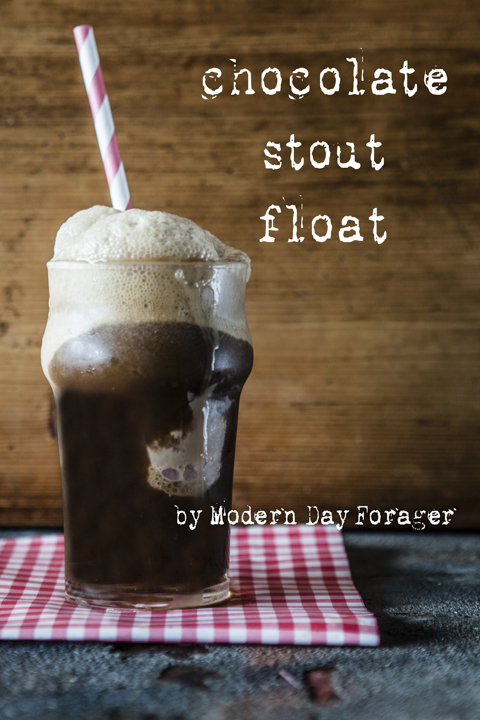 To build the float, we added some stout to our chilled glass giving us better control when we added the scoops of ice cream and the splash of beer, making a thick head of foam and overflow but not making a huge mess. The result was a extremely rich, thick, malty (with hints of hoppy bitterness), that really complimented the intensely flavored ice cream, creating a truly decadent dessert. Who says the kids have to have all the fun this summer…?!? Place chocolate pieces in a large bowl and set aside. Warm the milk, sugar, vanilla bean and salt in a medium saucepan over medium heat. In a medium bowl, whisk egg yolks, then slowly pour some of the warm milk mixture into the egg yolks, whisking constantly, to temper the yolks. Then add the warmed egg yolks back into the saucepan. Stir the mixture constantly over medium heat, scraping the bottom as you stir, once the mixture thickens and coats the spatula, pour it through a sieve on to the milk chocolate, stir until the chocolate is melted and smooth. Whisk in the cream and stout. Pour about half the stout in your chilled glass, (this will allow the ice cream to set up and you will have better control) followed by a large scoop of ice cream, then add a second scoop on top of that, add a splash of the stout to cover all of the ice cream to get a thick head of foam, add your favorite straw and serve immediately. 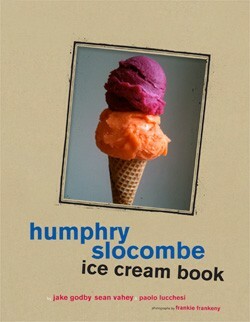 We all yearn for the days of the ice cream man, and our favorite quintessential summer time treat. 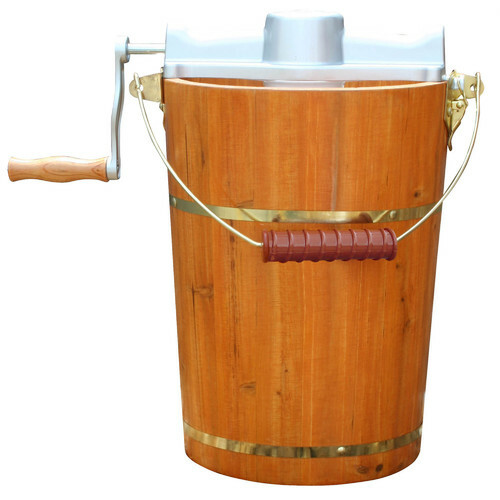 Well, we are here to tell you it is easier than you think, to churn out handcrafted artisan ice cream that tastes like an old fashioned summer. We are pushing the flavor boundaries this week, while celebrating National Ice Cream Month with a few frosty and icy goodies we came up with. So here is our inside scoop, and boy did we have fun. 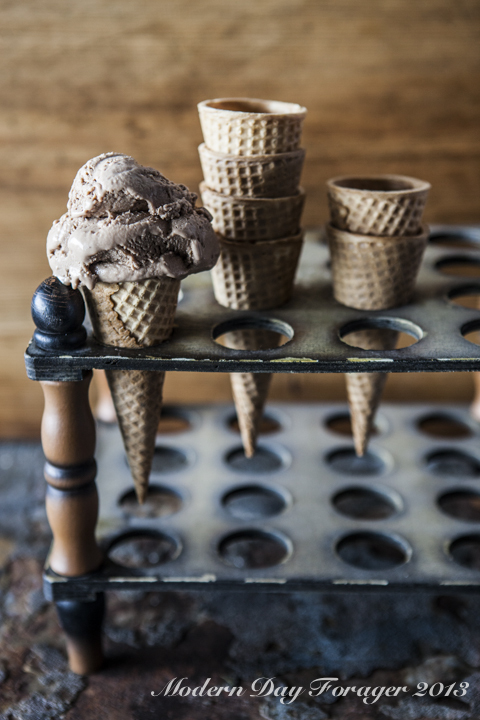 We started with all-natural fresh ingredients and made our ice cream in small batches. To ensure even more quality, we used our local sources and farmers, which gave us a better end result. 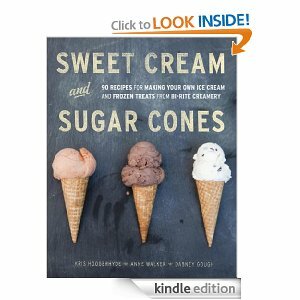 So no matter what your age, these recipes will make you as happy as when you were a kid, running down the street with a big old grin on your face, your pocket change and crumpled up wad of dollar bills in hand, to be the first in line to get your favorite frozen novelties. We had a very busy and productive week. We were very excited to bring street food to the pages of Modern Day Forager; it is a subject matter that is near and dear to our hearts for so many reasons, it is a culture we truly enjoy when we travel both here and abroad, it is a part of what we think will bring “community” back to our communities, it’s a connection to a simpler time and its just so darn tasty! Monday we got even more excited when we learned that our Summery Watermelon Soup from last week’s post was being re-published on a national healthy living web site called Hella Wella… Healthy living for the real world. Then, Tuesday we got an email from the Huffington Post asking us if they could use our photograph and recipe for the Simply Sensational Melon Sangria on their HUFFPOST TASTE . Our week was filled with the hunt and we were in of search of ingredients and inspiration, our first stop was at the Super L Ranch Market at The Chinese Cultural Center in Phoenix, where we found several ingredients on the MDF shopping list, a whole bunch of provisions that just looked fun and of course props, we are always in search of that perfect little treasure and this is the place. Next, we were off to Pro’sRanch Market in search of the perfect tortilla, specialty produce and props, of coarse. props. Our last stop was to Saffron Market which is located in north Scottsdale, were we found our dried chickpeas and ingredients to make our tahini sauce. One of the best parts of our field trip was that Heather’s daughter Bailey, who is nine, was along for the ride and adventure and how many cool food products we got to experience with her, she is not a stranger to these kinds of trips, however, we were thrilled we got to see it through her eyes as well as share and show her some things we have learned about these foods and cultures. 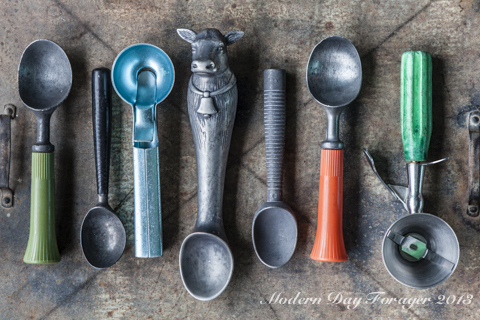 The hunt, the find and the get is something we talk about a lot here at Modern. Doing the R&D is a blast and is so satisfying. 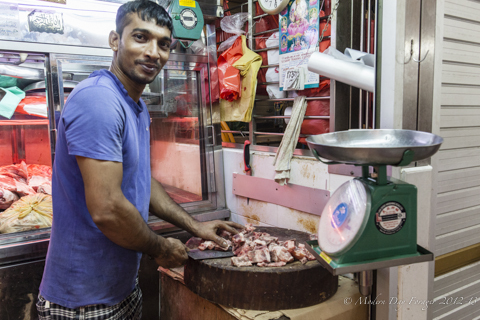 We reap the rewards by going to these markets and learning new things. If you missed any of the posts this week page down and take a look. 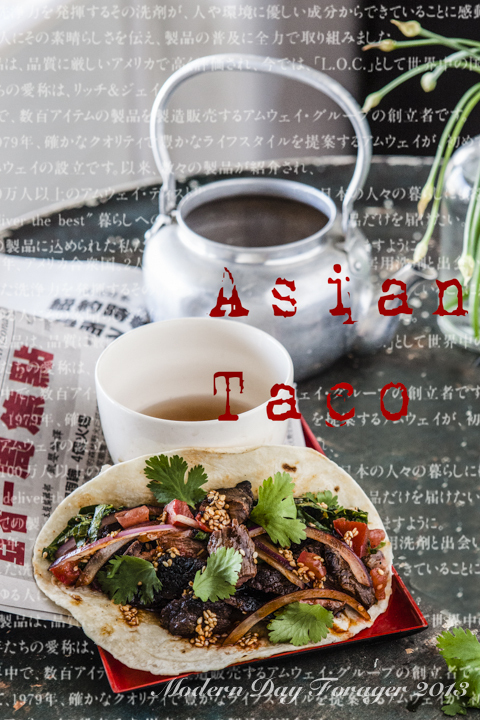 Tuesday featured an introduction written by Traci explaining why we are so fascinated with street food, the street food culture and why we think it is so important that we embrace it. Wednesday we gave you our first impressions of the new Scottsdale Food Truck Caravan, what a treat, you should stop by some Saturday evening and check it out and please let us know your thoughts in the comments area or on our facebook page. 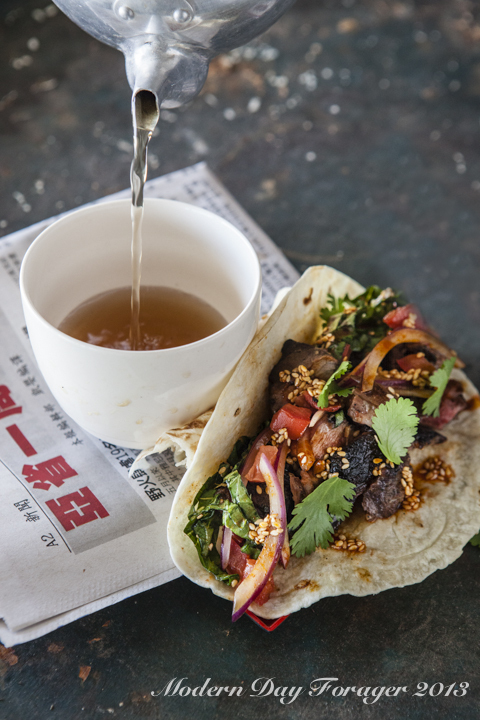 We jumped right into recipes on Thursday with our take on one of the most popular United States street foods, the Korean short rib taco, popularized by the LA food truck scene. If you have never experienced a First Friday in Venice CA. you are truly missing out. 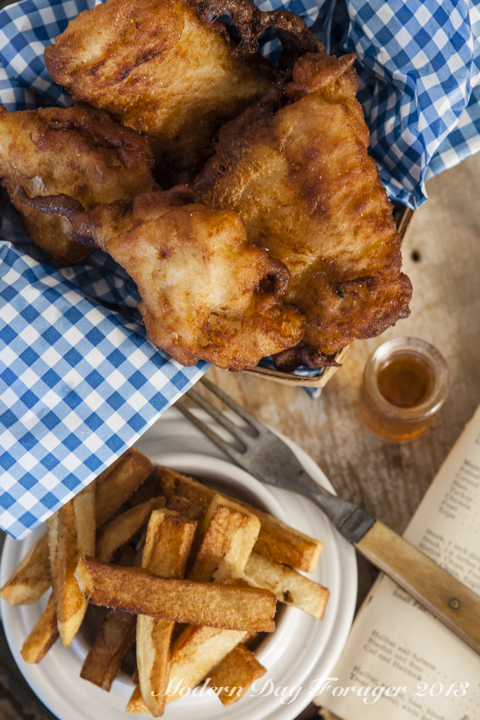 Next, we jumped across the pond to the United Kingdom (and Australia) for one of my favorite dishes Fish and Chips featuring a double or triple cooked chip and simple beer battered haddock or cod. For those of you that jump all over me for using lard in my recipes I fought the urge this time and went with peanut oil just for you, and its high smoke point. 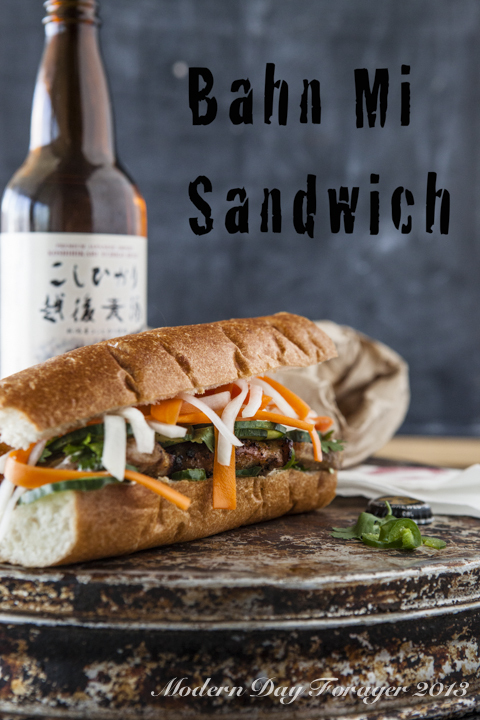 Yesterday we featured what I think is the most under appreciated sandwich here in the States, the Banh Mi. We did our MDF version with a lemongrass and spice infused pork, but you can use any meat you have on hand, the crunchy, sweet, savory and spicy elements in this sandwich are what pushes it over the top and Traci added an MDF twist to ours with Granny Smith apples and pickled watermelon rinds. Let us know your thoughts on the anything and everything we are doing here at MDF. Thanks. 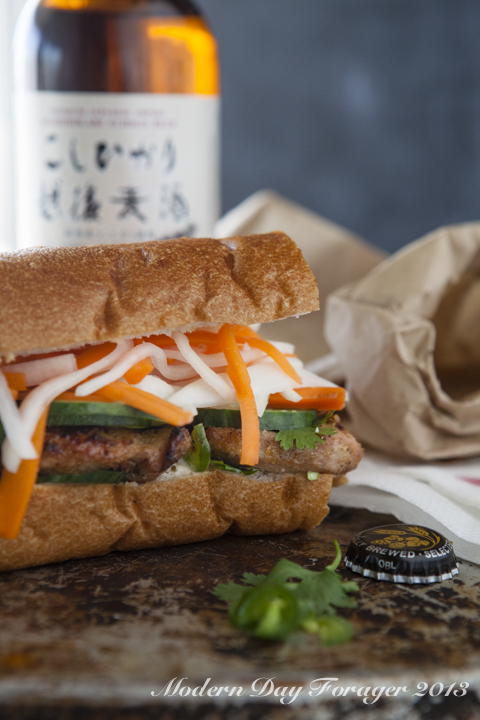 Banh mi is humble, but it packs a real flavor punch and with all the traveling we do, we have found one thing is for sure, no two versions are the same. Here is ours, we started with a golden crusty baguette with the right amount of chew, we hollowed out the interior of the bread just a bit, so we could add creamy Sriracha mayo, next we add the marinated pork (overnight) flavored with lemongrass and blended spices so the meat would be juicy, tender and succulent, then added it to the bread so that the bread could “sop up the juices”, packed it with a crunchy cucumbers, our twist with the addition of crispy Granny Smith apples, pickled carrot, daikon and added watermelon rind for our take on the traditional pickled veg and put it all together for a real show stopper. 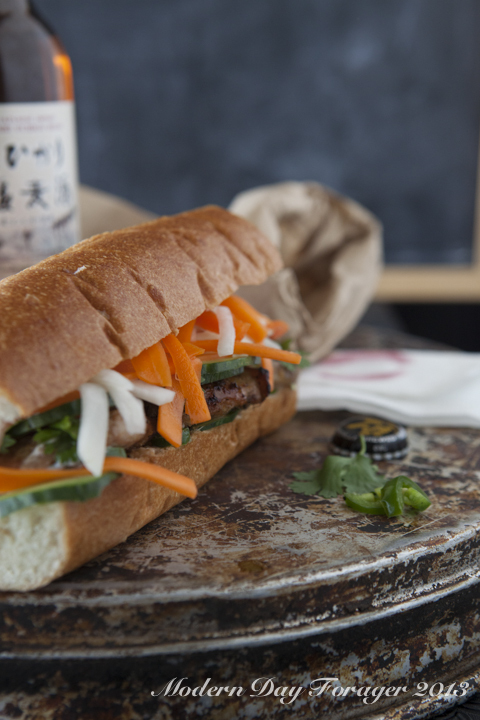 French baguette or French style hoagie roll (Traditional Banh Mi uses a Vietnamese style french baguette; usually made with a combination of rice and/or wheat flour, resulting in a very light, crackly crust and not overly dense bread. We like just nice French baguette, don’t use sourdough. Slice the baguette into 6 inch pieces and then slice in half. 1. Slice the bread lengthwise, and then use your fingers to make a trough in both halves. 2. Generously spreading the inside with mayonnaise. 3. Drizzle in some Maggi Sauce. 5. layer remaining ingredients on top of pork. In a food processor, process the sugar, garlic, shallot and lemongrass. Add the pepper, soy sauce, fish sauce, and oil and process to combine well. Transfer to a zip lock bag add the pork, and turn to coat well. 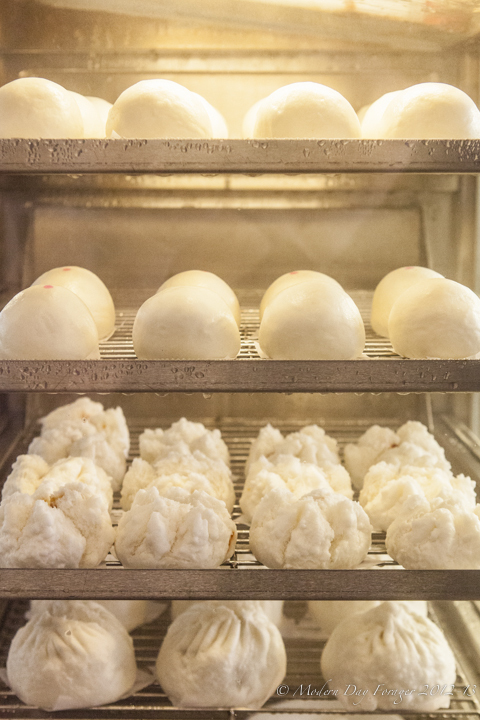 Refrigerate up to 24 hours. Let meat come to room temperature before grilling. Grill for 6 to 8 minutes, until cooked through. Let rest 10 minutes before slicing and serving. In a medium sized mixing bowl, combine the 1/2 cup sugar, vinegar, and water. Stir to dissolve the sugar. Pour over the vegetables, making sure the brine covers the vegetables. Let the vegetables marinate in the brine for at least 1 hour before eating. Place all ingredients in a medium sized mixing bowl and stir until there are no lumps. Cook potatoes in boiling water until just soft, about 5 min. 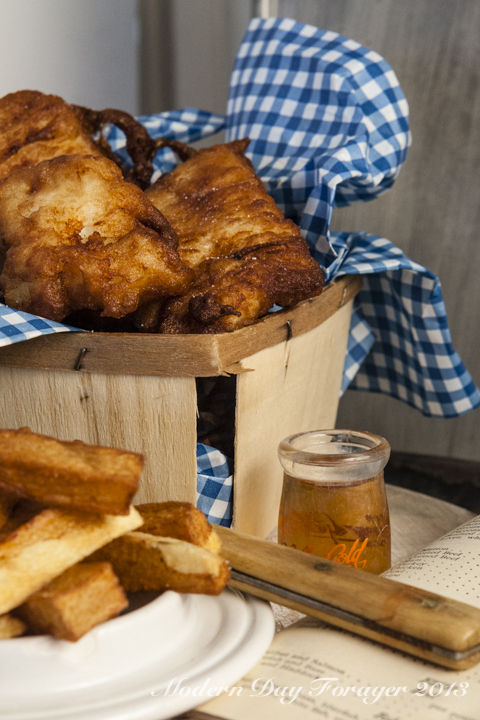 Cut fish into equal portions (about 4) Pat dry with paper towel and then in batter, fry one at a time until golden brown about 3 min per side. 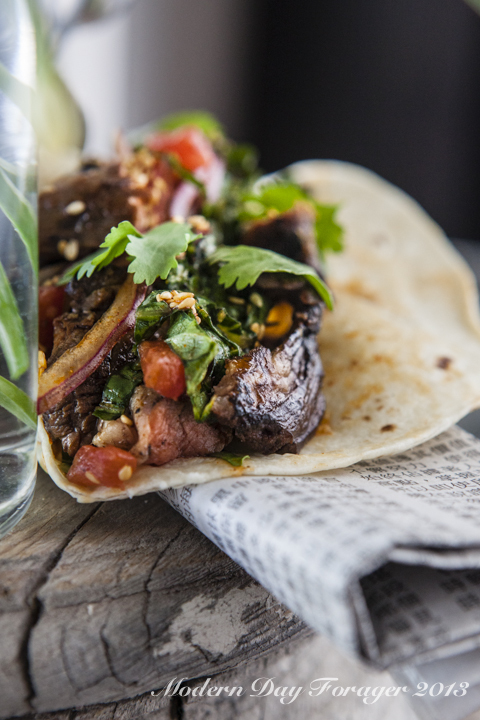 Bring your curbside cuisine inside to create your own table top taqueria. This recipe is the real deal, starting with a range of flavors, a smoky sweetness with a spicy kick, sesame seeds blended to bring out the nuttiness, brightness from all of the citrus, a punch of flavor with the addition of ginger and if that wasn’t enough a crispiness from the shredded romaine lettuce, red onion and juicy tomatoes, crowned with jalapeños and cilantro, all served in soft warm grilled flour tortillas. Embrace the taco trend and jump on the ubiquitous band wagon or should I say ubiquitous food truck. Enjoy! Place all marinade ingredients and short ribs to a large zip lock bag marinade the beef short ribs overnight in refrigerator. Add all sauce ingredients to a medium sized mixing bowl and mix well. Refrigerate until use.